You won’t see many floating docks in the Bay of Fundy, like you do on the Pacific Coast of North America. 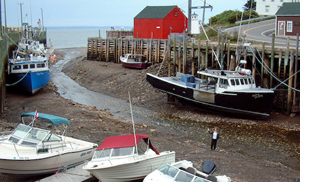 The reason why is really quite simple … low tide in harbours along the Bay of Fundy means no tide at all. You can actually stand on the ocean floor. So you can’t use floating docks. Such a place is Hall’s Harbour, west of Cape Split on the Nova Scotia side of the Bay of Fundy. Hall’s Harbour is a small fishing village with a narrow entrance to its tiny harbour. The breakwater is topped by multi-colored stones. Boats of all sizes, shapes, and colors are jammed in there, with long lines for low tide and short lines for high tide. Some of the larger boats are balanced on wooden crates strategically placed along the lower hull to prevent their tipping over at low tide.To get the full impact of the 40-55 foot range of tides for which the Bay of Fundy is renowned, you must see Hall’s Harbour at both low tide and high tide. You’ll have to wait about six hours to see both … but while you’re waiting, you can enjoy a fresh Atlantic lobster cooked to perfection at the Lobster Pound, located right in the harbour. Here, you can pick your own live lobster. While it cooks, enjoy a glass of Nova Scotia wine and savor the view of both the harbour and bay. Fishing boats, pine trees, sea breezes, and soaring seagulls complete the scene. And if you don’t know what to do with that bright red lobster when it appears in front of you, the staff are more than willing to help you with the intricacies of eating a whole lobster. Of course, you will be provided with a bib and lots of napkins. If lobster isn’t your thing, there’s an extensive menu which includes clams, scallops, haddock, and other seafood as well as burgers and hot dogs. For more information, visit: http://www.hallsharbour.org which will provide further links to Hall’s Harbour and the area.